James Barry Munnik (JBM) Hertzog was born in Soetendal Wellington on the 6 th of April 1866. Hertzog was the eighth child of Johannes Albertus Munnik Hertzog, a descendant of a German immigrant, Johann Barthold Hertzog, and Susanna Maria Jacoba Hamman. The first school he attended was in Kimberley, where he developed a dislike for foreign diggers on the mines, especially those from Britain. Armed with his qualification, ‘H' as he was popularly known, could not practice in the Cape Colony, as his registration with the Transvaal Bar did not allow him to do so. He established himself as an advocate in Pretoria in 1893. The following year he married Wilhelmina Jacoba (Mynie) Neethling whom he had met at Stellenbosch, and together they had three sons. In 1885 he was appointed Judge of the Orange Free State (OFS) where he befriended OFS President M.T. Steyn. Later, when the South African War broke out in October 1899, Hetzog's life changed forever. With the permission of M.T. Steyn he left office to serve as a legal adviser to the OFS forces in Kimberley. Just before the Boers' could lose the war, he was appointed commander in the field. 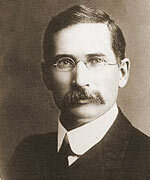 Subsequently, Hertzog became one of the signatories to the peace treaty of Vereeniging at Melrose House in Pretoria. As early as 1904 Hertzog became active in politics and began to be identified as a leader. In 1907 he was unopposed in the election for Member of Parliament of the Smithfield constituency. He represented this constituency for thirty-three consecutive years. He became the Minister of Education in the OFS and was responsible for drawing up a bilingual policy that advocated equal status to both English and Afrikaans. This caused an uproar amongst teachers who were, for the most part, not bilingual. At the height of this language struggle the unification of the four provinces was being negotiated and he was one of the delegates to the national convention in 1908 -1909. Hertzog and M. T. Steyn went to London in 1909 as members of the South African delegation to observe the South African Act being piloted through the British Parliament. The following year he was included in the Parliament of the Union of South Africa as the Minister of Justice and Native Affairs. Two years later, on 14 October, Hertzog delivered a key speech in Smithfield, a farm outside Orange Free State, where he called for South African nationalism of an exclusively Afrikaner flavour outside the rule of Britain. During the outbreak of World War I Hertzog was opposed to South Africa's participation: Because of his German background, he was sympathetic to their cause and openly showed sympathies with the 1914 rebellion. He led a deputation to England to present his case to the British Premier Lloyd George. But because he did not have a mandate from the South African prime minister, he could not speak on behalf of the country on matters of international interest. After the election of 1914 his Afrikaner National Party had 44 seats in the House of Assembly against 41 of the South African Party. Because of this the South African Party could not govern without the cooperation of other parties. An attempt was made to unite the National Party and the South African Party but failed because Hertzog was opposed to such a move. The Rand Rebellion of 1922 in the Witwatersrand drew Hertzog and F.H.P. Creswell, leader of the South African Labour Party, together as they ended up establishing cooperation between their parties. They both supported the strikers against General Jan Smuts. This cooperation resulted in a pact that stated they would not oppose one another's candidates in the election. The pact defeated the South African Party in the June 1924 elections. Hertzog became the new Prime Minister and included two Ministers from the Labour Party in his cabinet. In 1926 Hertzog was an integral part of the Imperial Conference which resulted in the Balfour Declaration. In 1928 he was instrumental in the establishment of the South African Iron and Steel Industrial Corporation(ISCOR). The following year, under his leadership, South African envoys were appointed to the United States, Italy and Holland. At the 1929 general election, although the Labour Party had split, Hertzog's National Party won enough seats to form a government on its own. But at the height of the world's recession, Hertzog refused to go off the gold standard and nearly brought the country to economic ruin thereby putting his own political career at risk. Pressurised by the veteran politician, Tielman Roos, who emerged from retirement to demand abandonment of the gold standard and the formation of a national government, Hertzog's government conceded, and there was an almost immediate improvement in the country's economic position. In 1918 South Africa adopted Die Stem van Suid-Afrika (The Call of South Africa) as the National Anthem which was officially played in Parliament in 1938. Hertzog believed that lasting international peace could only be achieved by addressing the Peace Treaty of Versailles. In 1933 Hertzog's National Party and Smuts's South African Party (SAP) fused, eventually to form the United South African National Party (United Party). D. F. Malan of the Cape National Party broke away in 1934 but reunited with Hertzog and some of his followers in 1939 to form the Reunited National Party (Herenigde Nasionale Party), the forerunner of the later National Party in South Africa. In 1940 Hertzog retired from active politics and died in 1942. • Potgieter, D. J. (ed) (1972). • De Kock, W.J. (ed)(1968).